Dr. Anthony Wojciechowski, Class of 1932, was known as one of Bartlett�s first �Big Men� and one of the key cogs in establishing Bartlett High School as one of Worcester County�s elite basketball programs in the early- and mid-1930s. Legendary Bartlett coach, George Finnegan, won consecutive Southern Worcester County championships from 1930 through 1936, with center Anthony Wojciechowski and fellow Bartlett Hall of Famer guard Joe White playing key roles in establishing that championship streak. White provided the scoring and Wojciechowski provided tenacious defense and controlled the rebounding on both the offensive and defensive boards. Anthony was tall, very strong, determined, and an exceptional leaper. 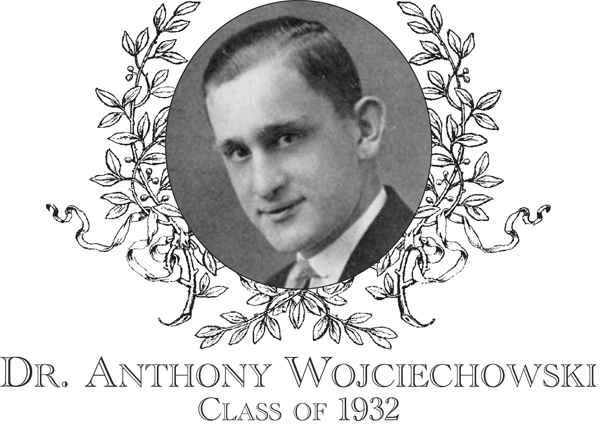 A Webster Times report from 1932 states, �Wojciechowski always wins the taps.� In Anthony�s senior year (1931-32 season), the Bartlett basketball program recorded a 20-and-3 record, which would be the first time any Bartlett squad won twenty games. Besides basketball, Anthony also played baseball, and lettered in both his sophomore and junior years. In his senior year, he decided to forgo playing baseball to concentrate on his academics. Anthony attended Worcester Academy for a year before moving on to Tufts University where he majored in the pre-med program. In 1936, Anthony entered Tufts Medical School and graduated in 1942. Upon graduation from Tufts, Dr. Wojciechowski entered the military and attained the rank of captain. In World War II, he proudly served with the 13th Portable Surgical unit in the Pacific Theater. Upon completion of his military duty, he opened a medical practice on Main Street in Webster and, for the next thirty-nine years, he served the community as a dedicated physician healing and touching the lives of many. In the medical community, he was well respected and served as president of the Webster-Dudley Medical Society, the Chief Medical Examiner for Southern Worcester County, and was the FAA flight examiner. �Dr. Tony�s� affiliation with Bartlett High School did not end in 1932. For about a twenty-year period, Dr. Wojciechowski conducted physicals every fall, winter and spring for all Bartlett athletes. Former Bartlett A.D. Donald Cushing described him as �conscientious, dedicated and sensitive� and was a tremendous asset to the athletes of Bartlett High School as team physician for several decades. Anthony and his wife Stephanie had two children, Robert and Phyllis, and six grandchildren.